The other night I had need to stop receiving a default route advertised from my BGP peer. I also thought it would be helpful for anyone that is needing to do this – and to help myself, since I forget often, to write it up. First thing we need to do is create a Prefix list to either allow or deny the routes we want. In this case I want to filter out the default route that is being propagated to me. The things to note, rule 10 – I match that route exact (default). then in rule 100 I allow any other prefix – hence the “le 32”. that means anything that starts from 0.0.0.0/0-32 and since the 0/0 is blocked already in policy 10- everything else is allowed. Then lets apply the route-map to our peer. After applying the route-map to the inbound direction we need to clear BGP either soft, or full to make our routing changes take effect. Run this command to check the BGP advertisements for changes, and synchronize after that. That should do it, and you will see the default route disappear from the routes learned from your peer. You can also do this to filter routes to any destination network. Fortigate – How to create a default route with a dynamic connection. Recently I needed to make sure select traffic would flow over a certain ISP link. Unfortunately that link had a dynamic address, which meant the address and gateway of that route could change anytime. Also I wanted to have my primary ISP failover to this link if needed. To accomplish these things I needed to have both default routes in my routing table at the same time. This means that they both have the same distance, but different priorities. One way to accomplish this is to configure a static default route, and just change the priority of the link , but how can you do this when you do not know the gateway? 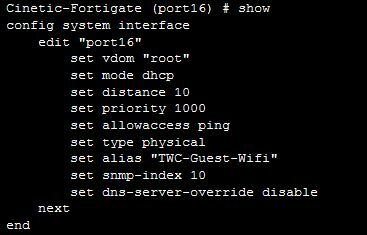 You can create a dynamic-gateway static route in the Fortigate. Through CLI you can create a dynamic gateway route using the above syntax. Remember, the higher the priority the less preferable the route. We have both default routes, and can successfully use a policy based route to push the needed traffic out.